As usual I was putting my head in the food cabinet trying to figure out what to make for dinner and my eyes fell on the mung beans. I wasn't too keen on making a curry or dal and after a bit of thinking decided to make dosa. Since I had come home early yesterday, I had enough time to soak the beans. If you wish to make dosa for dinner, I would suggest soaking the beans in the morning. If that isn't possible, 3-4 hours should be fine. This is quite a simple recipe, although I must admit that initially whenever I have made dosa, the first dosa from the batter has always been a total disaster but the rest would turn out fine. Now after practice and some patience, I manage to get them right ;) The key thing is to get the consistency of the batter and the heat of the pan right. The batter should be thin enough to spread and if the pan gets too hot, reduce the heat and let it stand for sometime before putting the batter. The batter makes about 10-12 dosas (depending on the size). Soak the mung beans in water (enough to cover them completely) for at least 3-4 hours. Drain the water and add the beans to a blender. Add the ginger garlic paste and green chilli paste. Add 250 ml of water and blend. Add the remaining water if the consistency of the batter is too thick. Then add the salt and chopped chillies and combine well. Heat a non stick griddle pan. Add a couple of drops of oil and spread it with a spatula. Lower the heat and pour a ladleful of mixture onto the centre of the pan. 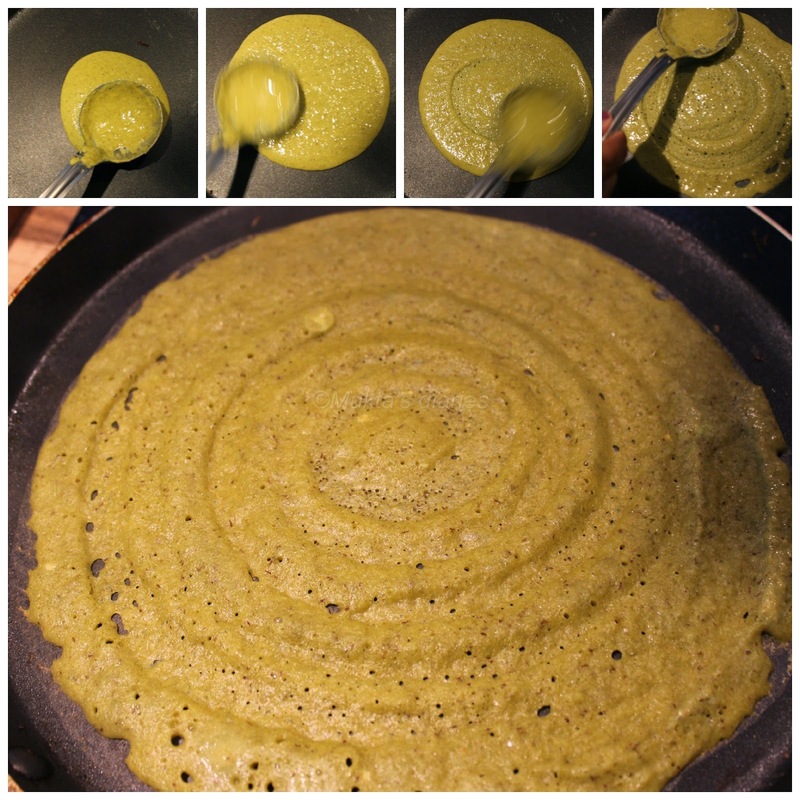 Immediately start spreading the mixture in circular manner to get a round and thin dosa. Increase the heat and let the dosa cook for a couple of minutes. Flip the dosa and cook the other side. Serve with any of your favourite dips. I like having it with yoghurt or with some hot & sweet sauce or chutney. If you follow a vegan diet, try them with coconut chutney.